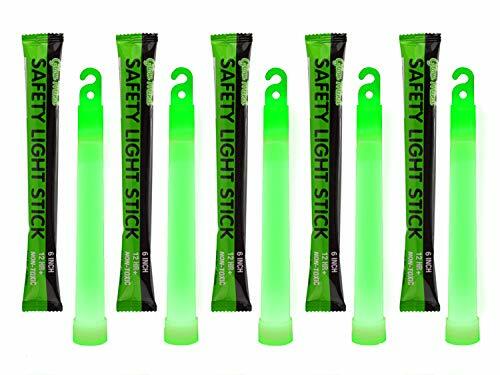 PERFECT FOR EMERGENCIES, BLACKOUTS, SURVIVAL KITS, CAMPING AND PARTIES - These green light sticks have so many different uses that make them a must have item. You will be amazed with how useful they are when you'll need them. You can also take them for fishing/hunting/boating trips or give them to your child for their night's party. PREMIUM QUALITY, SUPER BRIGHT AND LONGER LASTING (+12 HOURS) - Some customers say they are so bright you wouldn't want to look directly at them for the first half hour. They will provide the light power you need, when you need it most. And the best thing is that they last for 12 hours, which is 50% more than the regular 8 hours light sticks out there. 4 YEARS SHELF LIFE, GREAT VALUE PACK - Manufactured under strict quality guidelines, these glow sticks will work in years to come. It's a set and forget, maintenance free item. don't settle for anything for less. 100% MONEY BACK GUARANTEE - We're so confident that you'll love our light sticks that we'll refund every penny if you don't like it! Actually, most customers like it so much they buy more than 1 pack and give it out to their friends and family!